PHOENIX – During the Independence Day weekend, state and local agencies are focusing on keeping motorists safe and placing equipment and resources along heavily traveled highways to help move traffic should incidents occur. Motorists will play key roles in keeping traffic moving, too, by making smart driving decisions that won’t result in serious crashes that ruin road trips and create travel delays. The Arizona Department of Transportation and its contractors won’t schedule construction closures along state highways from Friday through late Tuesday evening. Drivers are urged to use caution over the holiday weekend in existing work zones and in three “holiday travel corridors” that will receive extra enforcement and resources to minimize travel delays. In an effort to reduce crashes and delays that result from speeding and driver inattention, speed limits will be lowered during peak holiday travel periods on a winding stretch of Interstate 17 north of Phoenix. ADOT will reduce speed limits by 10 mph Friday, June 30, on northbound I-17 between New River and Sunset Point Rest Area. Speed limits on the same stretch of southbound I-17 will be reduced by 10 mph on Tuesday, July 4. By obeying speed limits, driving safely and not allowing impaired persons behind the wheel, travelers can reduce the chance of serious crashes that often create long travel delays and close highways. In 2016, 14 fatal crashes occurred during the holiday weekend – alcohol played a role in eight – that killed 16 people. 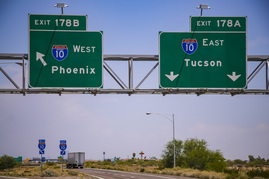 As they have during recent major holiday weekends, ADOT and the Arizona Department of Public Safety are emphasizing safety in three high-traffic zones: Interstate 17 between north Phoenix and Flagstaff, Interstate 10 between Phoenix and Tucson, and State Route 87 between Mesa and Payson. Along those routes, ADOT crews will strategically stage equipment, such as loaders and utility trucks, to minimize travel delays with faster response times to crashes and stalled vehicles. DPS will focus on preventing three leading causes of traffic deaths: speeding, impaired driving and lack of seat-belt use. The Governor’s Office of Highway Safety is working with state troopers, police officers and deputy sheriffs on a holiday DUI enforcement campaign. No closures are scheduled during the holiday weekend, but travelers should be aware that existing work-zone restrictions with lane reductions will remain in place. This includes a 30-mile stretch of I-40 east of Kingman and I-40 near Twin Arrows. As summer temperatures soar, so does the potential of brush fires and wildfires occurring. Travelers can minimize the risk of fires along Arizona roads by not parking or driving in dry, tall grass; making sure trailer chains are secured and not dragging and emitting sparks; and never throwing cigarettes out the window. Real-time highway conditions are available on ADOT’s Traveler Information Center at az511.gov, by calling 511 and through ADOT’s Twitter feed @ArizonaDOT.